Elise N. Bungo, CFA is a decision scientist, origami enthusiast, and science fiction and fantasy writer with degrees in cultural anthropology, psychology, and business. She’s worked around the world in jobs ranging from archaeology to economics. You should follow her on Twitter. My goal when I set out to write this article was to make it as difficult as possible for Dan to categorize. This is untrue, but the concept of value, on both a micro and macro level, is so fundamental to us that we often overlook it when we build our science fiction and fantasy worlds. I have read countless fantasy novels where there are whole chapters devoted to complex mythologies and magic systems or science fiction novels where there are pages upon pages about wildly imagined technologies, but both use a variation of a monetary system we would recognize today. 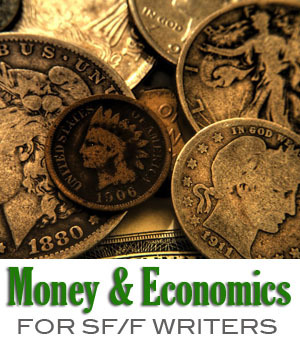 It may be a form of precious metal currency in fantasy or some greater abstraction of our current credit system in science fiction, but often, money and economic systems aren’t given a lot of thought by writers. There is an urban legend that the island of Manhattan was purchased for beads by an officer of the Dutch West India company in 1626. Research supports that this isn’t true, but let’s look at this transaction more closely. Feel free to insert here why the English or Portuguese as well. It is not a coincidence that many great naval powers are smaller countries with comparatively few natural resources. Wealth (i.e. control of resources) is a fundamental component of power. If there’s a war in your story, it’s about control of resources at some level, and the better you understand this, the more believable your conflict will be. Even the American Civil War, which most people believe to be about slavery, was largely about the economics of slavery and how this affected political control. In your fantasy or science fiction novel, what resources do your various groups have access to? How can they improve their resource portfolio? What social mechanisms enforce or detract from their claims to resources (war, legal systems, social and political alliances, etc.)? How are religious or cultural differences used to justify the acquisition of resources from another group? How do resources contribute to the balance of power in your society? 2. What’s in a Deed? The idea of land ownership is one that most of us take as a given. However, systems of land ownership and allocation vary widely throughout history. For many years, the common theory was that the Native Americans didn’t believe in land ownership; however, there is evidence to the contrary. They did have concepts of land ownership and responsibility, but they differed from the European systems. Thus, the tribe who sold Manhattan may have had a fundamentally different view of what they were giving up than the Dutch did. Also, the deed was signed by the Canarsees, a Lenape tribe, who didn’t control a portion the territory they signed away. In your book, how does the social system support resource claims? Do you have groups with very different legal or social structures regarding resource ownership and how might they clash? How are the rules of economic transactions governed by laws and social mores, and how well does each party understand the views of the other? For instance, throughout much of history, usury, or the lending of money at interest, was considered a sin, most notably in the Christian and Islamic world. Views on money lending after the fall of the Roman Empire did much to shape the course of European history. When the Dutch purchased Staten Island less than five years later, the deed records that the rights to the land were traded for a variety of equipment including kettles, axes, hoes, Jew’s harps, and most importantly, drilling awls, which were used to make wampum, the local shell bead currency. For the local tribe, European metallurgy was a superior resource, and thus held a great deal of value to them, regardless of the actual cost of production from a European perspective. Plus, the tribe also had a different view of land ownership as described above. On paper, from a Western point of view, the transaction looks wildly imbalanced, but it occurred because of the vast difference in the way each party viewed the same transaction. Of course, the European’s metallurgical advantage also provided them with superior weaponry, which may have influenced the transaction. How do concepts of utility, law, social mores, differing perceptions of value, and different value weightings at a societal level shape the interactions between groups in your novel? What happens when groups have similar views? What happens when they have different views? Macroeconomics deals with the structure and interaction of larger scale economies at the national, regional, or global level. Trade, currency systems, the interaction of currencies (exchange rates), technological advance, unemployment, and policy are all macroeconomic concepts. Monetary policy is how your society controls money. How centralized are your cultures’ banking systems? What do your cultures use for money? How abstract is the currency? By this I mean, is it gold or is it paper? Is it paper backed by gold? Is it 7th generation bitcoin on steroids? In his The Philosophy of Money, Georg Simmel discussed the psychological effects of living in a society where life was increasingly measured in money and where money itself became ever more abstract. He posited that it psychologically divorced man from life, making us hyper rational and less human (think Iacocca and the Pinto debacle). How does value in the monetary sense shape value in the philosophical sense? What do your characters believe constitutes a good life and how do they value life? What social, religious, and philosophical concepts influence this? Fiscal policy is how the government influences the economy through instruments like taxes, expenditures, and debt. When governments break down, such as after the fall of the Roman Empire, fiscal and monetary systems break down as well, and the more unique to your culture or abstract your currency, the bigger effect this will have on society. If your book has an empire that is collapsing and its currency is gold and all its neighbors’ currency is also gold, then it will have less effect than if the modern US government were to fall and with it the US fiscal and monetary systems (think banks, credit, and markets). But as a rule of thumb, if your government is weak or collapsing, expect this to show up in day-to-day transactions somehow, at minimum as a wariness of the local currency and likely an increase in barter transactions. A currency with no intrinsic utility (like paper money) is completely dependent on a functioning society to provide its value. The term mesoeconomics is not as well-known as its macro and micro counterparts, but is sometimes used to describe those economic concepts that are between macro and micro economics. Two areas that are commonly thought of as existing in the realm of mesoeconomics are game theory and information theory. For our purposes, I would like to use it to describe societal interactions within a nation or culture. In your work, how does society organize itself with respect to values? Is there a division of labor? If so, how does the society ensure that general needs are met? What are the social constructs that either lift your society up or tear it apart? How do people negotiate with other to get through daily life? How do transactions form bonds within your culture (i.e. a gift economy)? For example, Robert Wright, in his book Nonzero: The Logic of Human Destiny makes the argument that social progress is the effect of societal non-zero sum games (a zero-sum game is game where if one party wins an amount, the other party loses that same amount). Non-zero sum games are not strictly competitive, and thus have elements of cooperation that can benefit both parties in certain situations and “make the pie bigger”. Wright describes technological change as a key nonzero event. If technology makes the pie bigger, how is the pie shared? And what effects does this have on your society and between societies? Microeconomics is the study of how we as individuals allocate our scarce resources (time, energy, money, etc.) to create value. To understand our characters’ microeconomic situations, we need to know what they value and what resources they have at their disposal to obtain what they value. Disconnects of resources and values can make for rich internal and external conflicts. Enter my friend, Maslow’s pyramid. 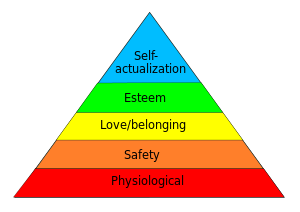 Maslow’s hierarchy of needs states that humans will strive to meet these needs starting at the bottom and moving up and will allocate their resources accordingly (e.g. if you are dying of thirst or starving, you will not be allocating your resources toward gaining respect from others). Where are your characters on Maslow’s pyramid? Are they searching for self-actualization, striving to be the best they can be? Or are they struggling to survive? What happens when life forces a character who was once concerned with self-actualization to beg for food? Or steal? How would a character who is searching for belonging react differently to the same situation from a character who is searching for esteem? How can a mismatch in resources and values cause difficulty for your characters? Values and value systems at a personal and societal level are fundamental to the human experience. A little thought about resources and resource allocation can add depth to your characters and nuance to your world building. Graeber, D. (2011). Debt: The First 5,000 Years. Brooklyn, NY, USA: Melville House Publishing. Muller, J. Z. (2002). The Mind and the Market: Capitalism in Western Thought. New York, NY, USA: Anchor Books. Simmel, G. (2004). The Philosophy of Money. (D. Frisby, Ed., T. Bottomore, D. Frisby, & K. Mengelberg, Trans.) New York, NY, USA: Routledge. Wright, R. (2000). Nonzero: The Logic of Human Destiny. New York, NY, USA: Pantheon Books. Excellent post! This has given me a lot of food for thought. I’m working on a novel that involves a heavily oligarchical society, with certain groups in the country that are inherently considered “inferior” for reasons beyond just race (something like Irish immigrants in America in the early 20th century), and I’ve been pondering the problem of WHY. Considering the economic impact more heavily actually makes a lot of sense. It’s all well and good and dramatic to present the ruling class as generic wealthy racist bastards, but I think I ought to delve deeper into the basis of this nation’s economy, and how the upper classes benefit from the state of the lower classes. A real worldview conflict between the groups in this novel would benefit from the questions of “what do they value?” and “what does wealth mean to them?”. Thanks for the post! This is a great post! I’d like to point out two writers who tackle this exact question very well. One is Leigh Bardugo, who set her books in an alternate Hanseatic League. The other, who is still more impressive to me, is Steve Lyon. His future America is radically non-capitalist and based strictly on barter; the title is “The Gift Moves”.